"Today′s emerging generation of donors are driven by a new definition of success: impact. This is clear through Goldseker and Moody′s work, which uncovers the motives and approaches driving today′s new strategic philanthropists. Many close friends are profiled in this book, and I can attest to their earnest, values–driven approach. 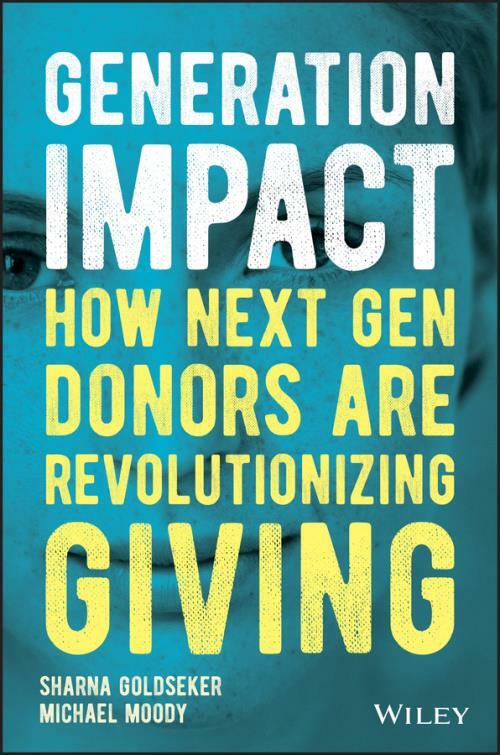 For anyone who is eager to understand the next gen donor, this book offers truly valuable insights." "Philanthropy is changing, and with it, the world. Generation Impact demonstrates, with data and vivid personal stories, that Gen Xers and Millennials are aligning their values, their giving, and their lives. This is a must–read book for anyone concerned with the future of philanthropy." "Finally! Goldseker and Moody have produced a sorely needed, clear–minded view of how Millennials and Gen–Xers approach giving. They slash some stereotypes like Millennial selfishness and offer other fresh views, showing in some ways how next gen donors approach philanthropy differently than previous generations, such as their willingness to ′use all the tools′ and drive impact through for–profit as well as more traditional charitable means. But many young philanthropists are also simply following in their parents′ footsteps. This honest look at next–gen philanthropy, told with well–written, real life examples, is a must–read." Meet the next generation of big donors the Gen X and Millennial philanthropists who will be the most significant donors ever and will shape our world in profound ways. Hear them describe their ambitious plans to revolutionize giving so it achieves greater impact. And learn how to help them succeed in a world that needs smart, effective donors now more than ever. Next gen donors will have unprecedented resources to give, some as creators of vast new fortunes and some as the inheritors of the greatest generational transfer of wealth in history. If they succeed in revolutionizing giving, donors stand a chance to make unprecedented progress on causes from education to the environment, from human rights to health care. And instead of waiting until they retire to a life of philanthropic leisure, they want to make these changes NOW. Chapter 3: Why Not Innovate?